Height adjustable study desk for children from Mount-It!. Desk and chair combination is ideal for ages from 3 to 10. Both the table and the chair height can be adjusted to grow the workstation with your child. Perfect for your child's rooms, study areas and activity rooms. Tilted desktop improves ergonomics and is perfect for reading, writing and play. Large desktop measures 28 inches wide by 15 inches deep. Made from steel frame, ABS+PP plastic and MDF for premium look and durability. All materials pass regulatory requirements for safe usage. Adjustable feet levelers ensure steady installation on uneven surfaces. Comes with a drawer with ample storage area under the desktop for books, paper and school supplies. Metal hook keeps backpacks and crayons, pens, markers organized. Manually adjust the height of the table from 21.2 inches to 30 inches. The chair can go from 12 inches minimum height to 17.3 inches maximum height. Chair has vented plastic surfacing for cooling. 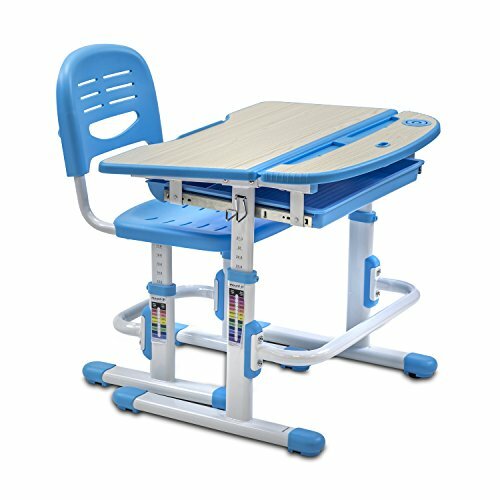 This children's desk is ergonomically designed for comfortable sitting and proper body positioning which is important in maintaining good health even from a young age. CHILDRENS DESK - Premium height adjustable study table for kids that will keep the little ones motivated for studying and learning. Colorful and modern design that will brighten up their rooms. GROWS WITH YOUR CHILD - Height adjustment of about 9 inches ensures this study and activity table grows with your child. Both the chair and the desktop can be raised for most suitable and ergonomical size. TABLE AND CHAIR SET - Comes as a set with solid steel frame table and chair. The comfortable chair comes with ventilation holes for air circulation. TILTED DESKTOP - The desktop is tilted at an optimal angle for writing, reading and drawing. Prevents slouching and promotes healthy posture. Rubber safety stops prevent pinching. VALUABLE ACCESSORIES - Dedicated hooks help your child stay organized. Shelf under the desktop stores books, paper and school supplies.